What a wonderful evening of community spirit in downtown Weed! 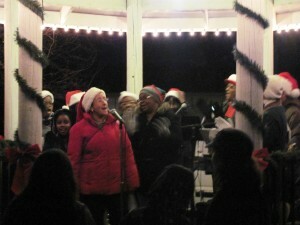 The evening was full of singing, laughter, lights, hot coco, chilli, cookies, and the true meaning of Christmas! Jeannie Tuman, Weed Chamber Board Director, coordinated the evening in collaboration with Sally Acquistapace, Erika Evangelist, and other community organizations WRC and Tri Counties Bank. Santa arrived thanks to the Weed Fire Dept. 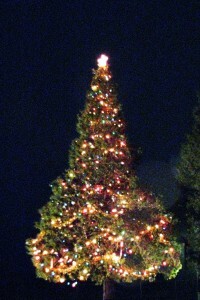 ; the childeren’s eyes lit up as bright as the Town Tree. 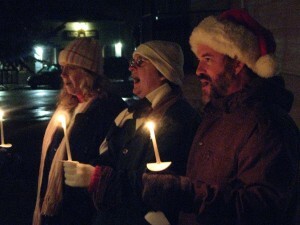 Mayor Pearce spoke, and local churches performed music throughout the evening. The Community of Weed gathered with candles in hand to sing tradiotional Christmas songs that warmed us all that cold December evening! Special thanks to Weed Rental Center for use of their propaned heaters that circled the area warming hands and noses. If you’re looking for a small town Old Fashioned Christmas to enjoy, Weed, California is the place for you! Come see us in December!